It is widely acknowledged that Thanksgiving Eve is one of the best bar nights of the year. Make Stone Water your destination for dinner, drinks, and fun with friends. 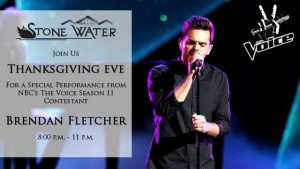 Brendan Fletcher, a 2016 contestant on The Voice will perform from 8 – 11 p.m., providing a superb musical backdrop for the evening. No need to purchase tickets ahead of time and no cover at the door… just the lake’s best food, drinks, and entertainment!